We are proud to announce the launch of Senninger’s new online training courses, now available to all Senninger customers via the Hunter University training portal. 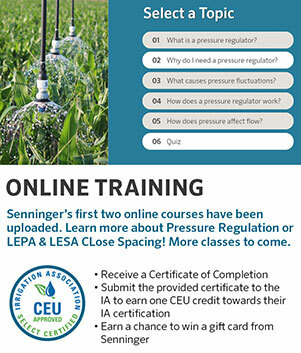 Anyone who successfully completes a Senninger course will receive a certificate of completion they can submit to the Irrigation Association (IA). Each course is worth 1 continuing education unit (CEU) toward maintaining a current IA certification. In addition, everyone who completes a course will have their name entered in a drawing to win a $25 gift card from Senninger. Senninger is rolling out this new offering with two courses: Understanding Pressure Regulation and LEPA & LESA Close Spacing. The pressure regulation course will allow learners to discover the basics of pressure regulators and learn how to install pressure regulators in different irrigation systems, recommend a model to customers, identify problems and troubleshoot with ease. The LEPA and LESA Close Spacing course cover the basics of LEPA and LESA irrigation, the best practices for installing these systems, the many sprinkler options available today, and how farmers are using these to save water, conserve energy and increase yields. You can find more information on the Senninger online training webpage, including an overview of courses available and link to Senninger and Hunter's Online Training Site where you can create an account and begin your education.